Investigation into the March 15, 2018 collapse of a pedestrian bridge at FIU-Sweetwater is still underway, but one thing is clear: six people died and several more were injured due to the bridge’s failure. The Beregovich Law Firm is representing victims of the Miami bridge collapse with the intention of securing settlements that will help the injured parties recover from the financial and emotional trauma of the incident. The bridge was not yet complete and was not open for public use when it failed, which was instrumental in limiting the number of people injured. No one knows for sure just why it failed, however, cracks had been observed in the bridge prior to March 15 and the bridge was undergoing a stress test at the time of the collapse. It is possible that both of these factors may have played a role in the collapse. Despite its’ incomplete nature and despite evidence of cracks in the bridge, work on the project continued and traffic was allowed to continue to flow underneath the bridge. We all know what happened next. Unfortunately, this type of skirting around safety requirements is very common in construction projects. There is pressure to limit disruption to the public’s normal daily operations along with pressure to complete projects on time. In many cases, these time pressures win over the public’s safety. Failing to reroute vehicular traffic under the Bridge. At a minimum, this should have been done when the bridge was undergoing stress testing. Ideally, it should have been done any time work was being done on the bridge while it was in place over the roadway. Failing to warn of an ultra hazardous condition. The fact that the bridge had a crack in it would qualify as an ultra hazardous condition. The public should have been warned that there was a danger and access blocked. Failing to provide redundancy or collateral support while operating on the Bridge. This is a basic safety precaution when working on bridges and particularly when subjecting the bridge to additional strain as in a stress test. Failing to suspend operations on the Bridge until public access was blocked or precluded. Despite the uncertainties surrounding the reasons behind the collapse, it is possible to begin legal action on behalf of the victims. Investigation into the failure of the structure and investigation into negligence of duty are two different things. 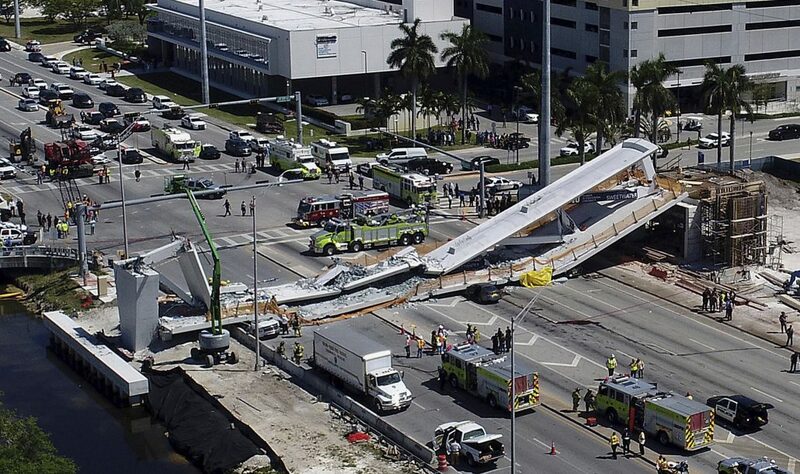 In projects like the FIU bridge construction, engineering firms and construction management companies are expected to take actions to protect the public’s safety; they have a duty to perform their work in a safe manner and in a way that does not endanger the public. In fact, FIU made sure to include in the project scope that the public’s safety was a “primary expectation” in the design and construction of the bridge. When the companies involved in projects like this do not take reasonable precautions to protect the public safety, accidents happen and the companies should be held responsible for the injuries that occur. Through no fault of their own, accident victims are suddenly faced with multiple injuries and damage to their vehicles. They have a right to seek compensation from the ones responsible for those damages. That’s why The Beregovich Law Firm is working with bridge accident victims. We believe there were negligent actions on the part of those working on the bridge project and that those parties should be held accountable for the damages that resulted. If you have been injured and you think negligence may be a factor, contact The Beregovich Law Firm at (800) 631-9009 or email us to discuss your situation with our personal injury attorney. It is possible that you are entitled to compensation for the damages you’ve sustained. The 4 Most Dangerous Types of Car Accidents What Is Considered Medical Malpractice?